On wet hair: use a tablespoon worth of product (more or less, depending on the length of your hair) rub into your palms, and apply all over your hair. With a delicate touch, make circular motions until you feel the paste turn to foam, and make sure you lift the roots. Add a little water, emulsify, and rinse abundantly. For an intensified effect: let it sit for 2 minutes before you rinse. Then, apply the volumizing conditioner to lengths and ends. I bought this product based on some FB friends’ recommendation. I also bought the purifying cleansing scrub with sea salt and love both. I am not sure if this one actually “volumizing” my hair; but it cleans my scalp so well that the root of my hair feel more pumped after blow dry. 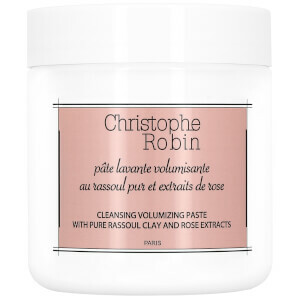 I am not a fan of rose scent in general, but the scent after wash is very elegant and velvety that I fell in love with it! I was skeptical of this shampoo. And the first time I used it I was not impressed - because I used a too much. My second try made me a believer. I use about a half a tablespoon of the stuff, rub it between my hands and then distribute through out my hair. It lathers great! I leave it on a couple of minutes and rinse out. If I blow dry my hair - I get big volume. My hair looks and feels so much fuller than it ever has. I'm convinced that my other shampoos are weighing down my hair. This puffs up the individual strands and makes it look like I have a ton of hair - and that is saying something with my hair. I'm thrilled that I found this product!